Goodies aren’t so good. Self control, have you heard of it? Here, in the US, we are surrounded by junk food all the time. For office parties, cookies, candy, cakes, muffins, donuts, chips, all of those things are presented…and how do we say no? Well, we usually don’t. We usually make up an excuse to yourselves, something like, “well it IS a special occasion…”, or “I’ll only have a little piece”, or “I’ll eat a big salad for dinner and nothing for lunch except this yummy muffin”, or even “well if I have a bowl of fruit, the donut, and a cup of coffee, I’ll feel fine!” but yet, alas, none of these things are good enough. When we consume sugar, anything over 4 TBLS at a time, we shock our system. Do you get that afternoon drowsiness if you eat a big salad and a cup of homemade soup? Probably not. We have gotten so used to that tired, sluggish feeling, that we’ve forgotten what it is like to NOT feel that way. What would it be like if every time you ate a snack at work it was a fruit or vegetable? Probably a whole lot better. Now, treats are good. Every so often we should indulge. Shoot, indulge every day if you want to, but make the better choice in your indulgences. Choose the whole foods. Make your own baked goods. Go to a specialty chocolate shop and buy some rich, dark chocolate. Buy fair-trade organic chocolate. Make your own muffins. This way, you’ll know what you’re putting into your body. Just an hour ago, I was starting to get hungry but wasn’t able to eat my lunch…so I cut myself a slice of a blueberry loaf. I didn’t look at the ingredients, I didn’t want to know. It was from Bob Evans, so I knew enough. I knew that I should have avoided it, made myself a cup of hot tea, and waited until I could sit down and enjoy a meal. But no, I ate it anyways…and the 5 seconds that it lasted, it tasted GOOD. But, well, moments later, I was tired. I started to feel mucus building up. I felt my lymph-nodes swell up. Man, do I want to go to sleep. Seems harmless, right? Now turn it around and look at the ingredient list. There is nothing wholesome about this treat. 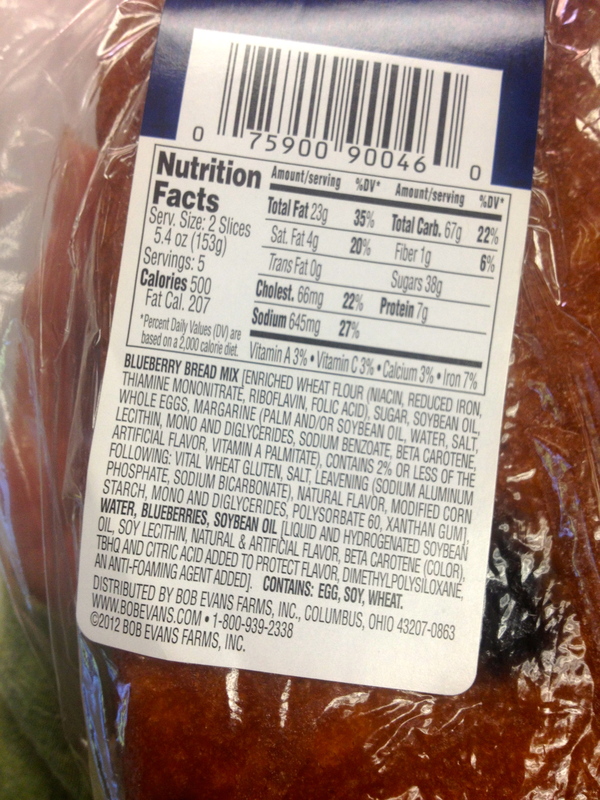 Notice the ridiculous amounts of ingredients, including those that I NEVER would use in my kitchen: soybean oil, margarine, mono & diglycerides, sodium benzoate, artificial flavor, modified corn starch, polysorbate 60, xanthan gum. AND I will tell you that my blueberries are just blueberries…not containing soybean oil (TRANS FAT, even though it says 0 grams), artificial flavor, beta carotene for color (orange? doesn’t make sense), soy lecithin, dimethylpolysiloxane (WHAT DID YOU SAY? ), and TBHQ. Who in the hell makes this crap? Oh yeah, Bob Evans Farms, INC. I’d like to see this farm…where the blueberries come straight out of chemicals! 500 calories in two slices? Gross. Some of my favorites include trail mix, smoothies, nut butter boat (ants on a log), and an apple with almond butter. 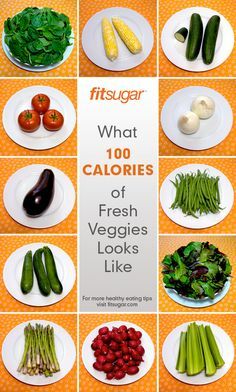 100 calories of sweets is so small compared to 100 calories from veggies. Maybe I’m just a muncher, but I always want to feel like I’m eating more. 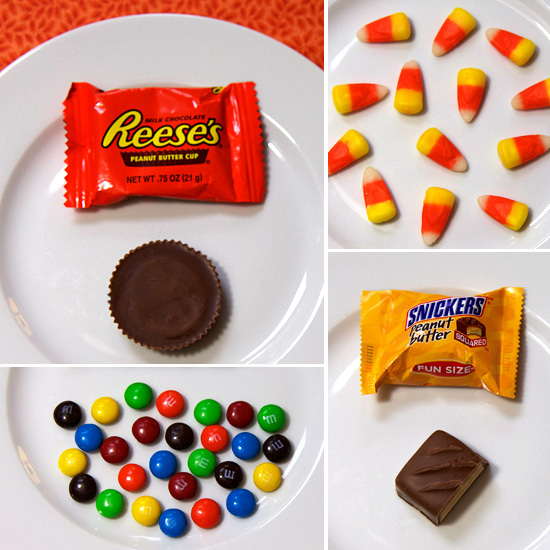 So, compare…a plate full of veggies, or one Reese’s cup? I’ll choose the veggies. And who said you have to stop that at 100 calories? What do you do when the temptation is calling from the break room?